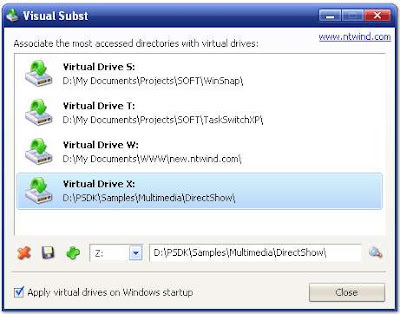 Visual Subst can associate any folder with a virtual hard drive in order to make it readily accessible in ’My Computer’ or by simply typing in the virtual drive letter in the folder address prompt. If you frequently work with a folder or folders that are buried deep within your system’s folder hierarchy (say, something like “C:\Program Files\KillerApp\Templates\Folder”), you can use Visual Subst to associate said folder with a virtual drive, (”x:”, for example), making it much more easily accessible simply by typing in “x:” in any folder address prompt or clicking the new “x:” drive directly from ’My Computer’. Note that this program does not actually change the location of your folder (it is still in its original location and can be navigated to from the folder structure). Also, the virtual drive can be easily removed at any point.